The index opened positive and stayed strong making a high of 8819 but close just below 8800 at 8786.20, gain of 41.85 points. The broader market though was negative with 757 advances to 855 declines. Range stays at 8500-9000. Call option 8900-9400 added 21.06 lacs OI with short covering at 8800 and below strike prices. 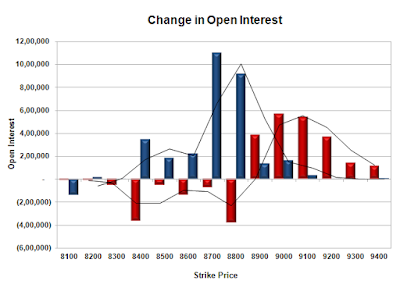 Put option 9000-8400 added 30.61 lacs OI with profit booking at 8300 and below strike prices. 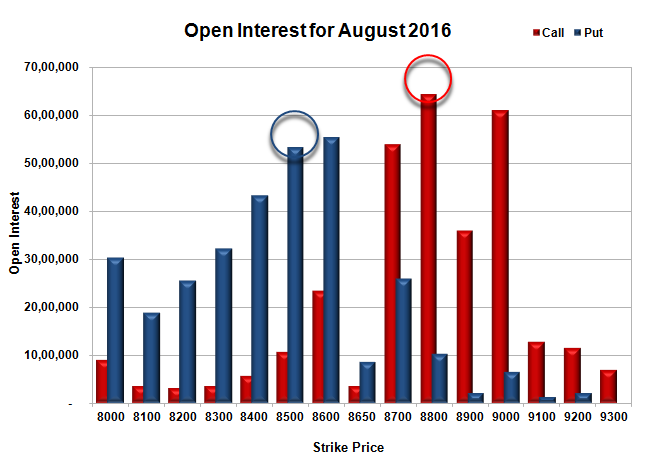 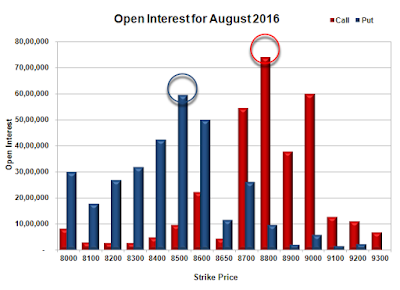 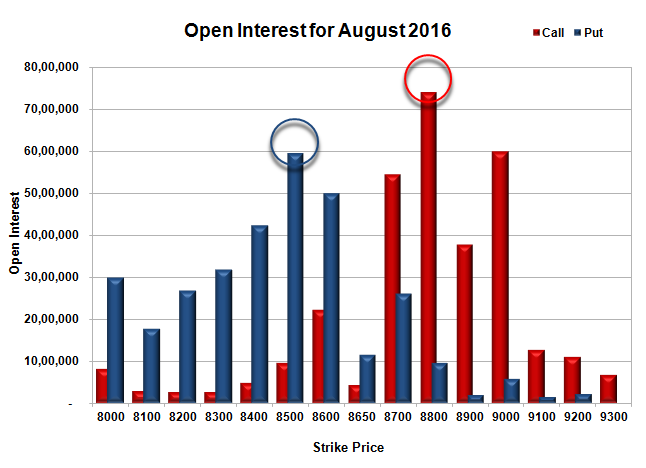 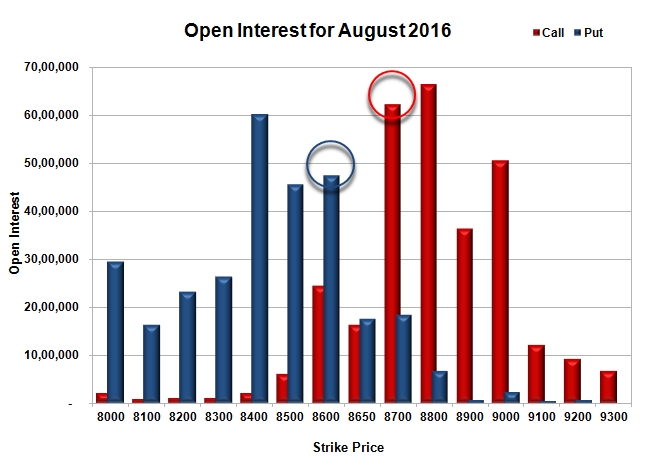 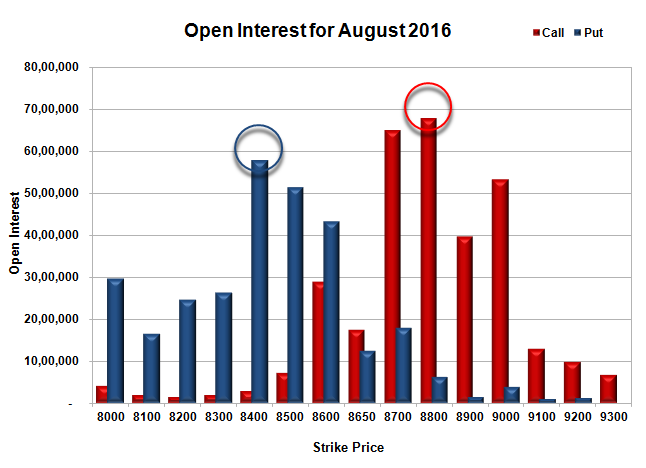 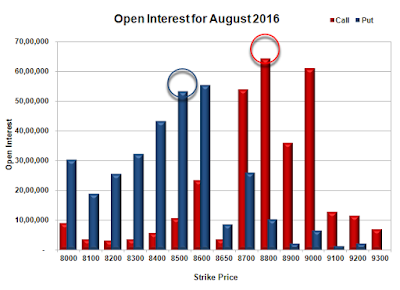 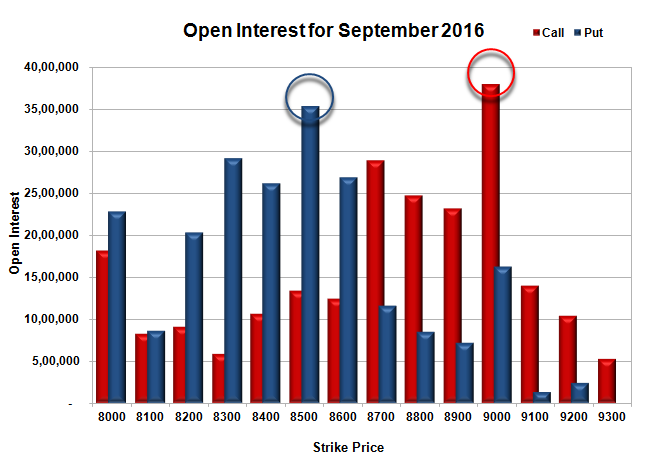 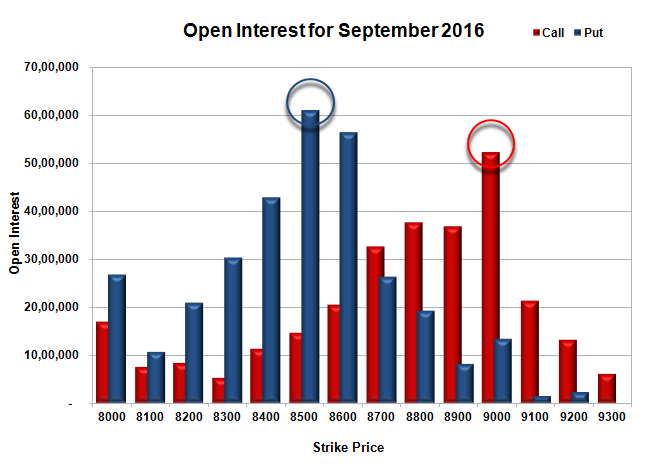 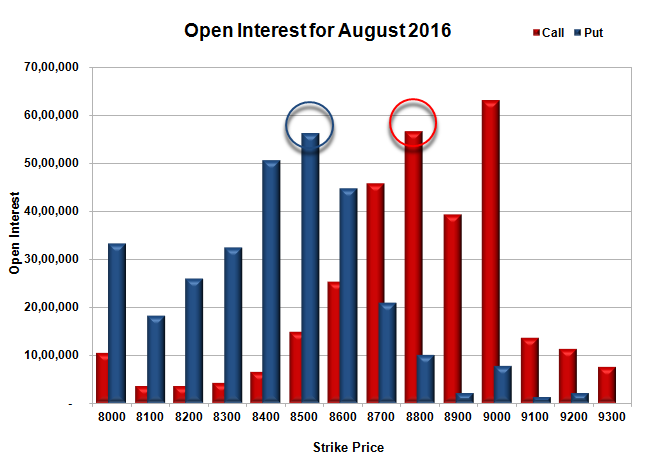 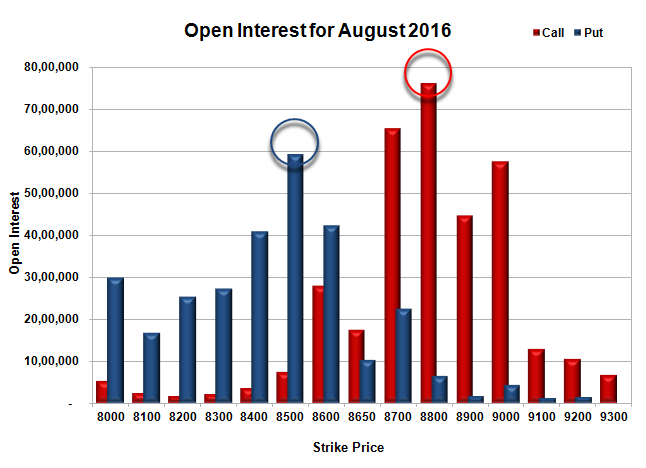 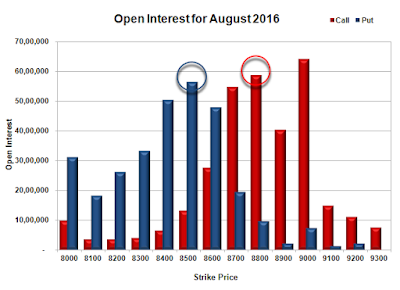 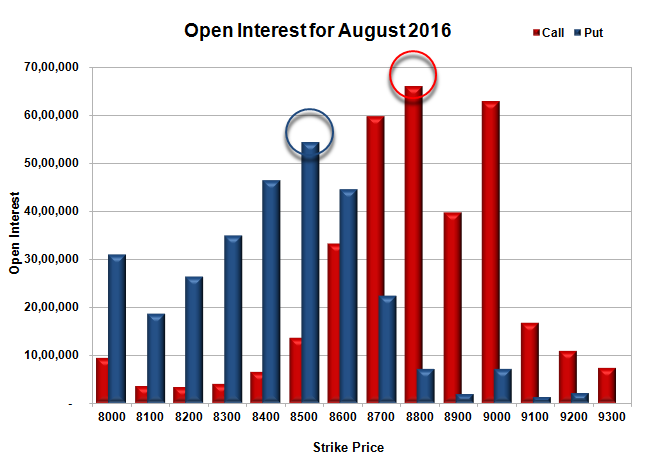 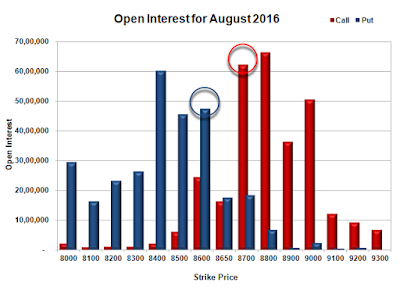 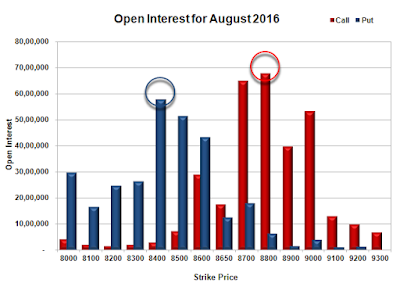 Nifty Open Interest is at 3,30,23,850 up by 25,72,425, with increase in price, probably huge long build-up. 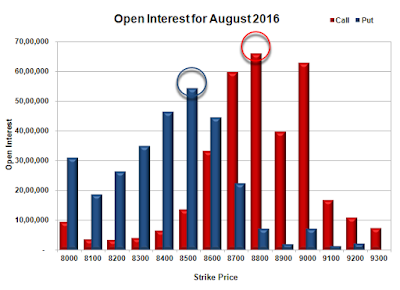 Bank Nifty Open Interest is at 28,25,760 up by 2,11,920, with increase in price, probably huge long build-up. 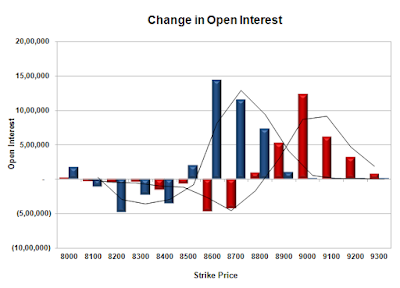 FII’s bought huge 43818 contracts of Index Futures, which includes net 35858 contracts long build-up and 7960 contracts short covering, with increase in net OI by 27898 contracts, includes 79671 longs to 35853 shorts for the day. 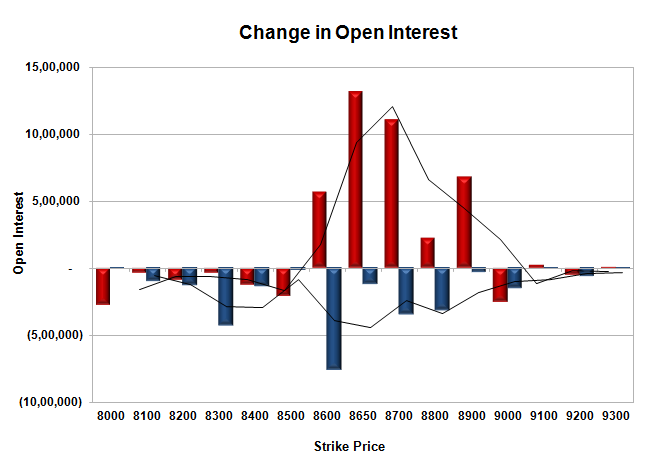 FII’s Index future open contract as on date is 389136 Longs to 35174 Shorts, Net long 353962 contracts. 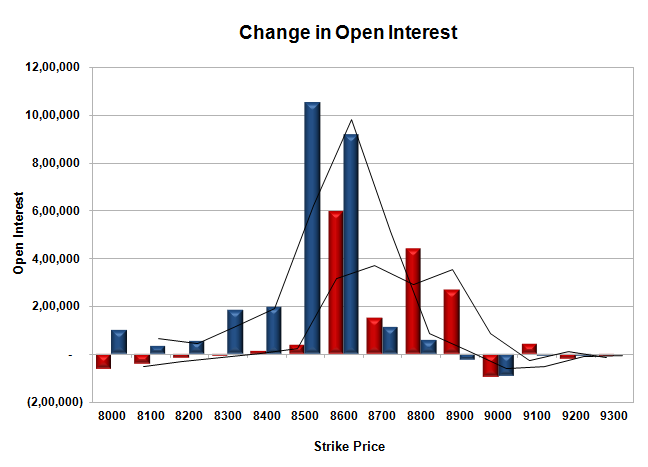 Initial support at 8700, with OI of 37.36 lacs and below that at 8600 with OI of 58.64 lacs. Initial resistance at 8800, with OI of 33.83 lacs and above that at 9000 with OI of 57.97 lacs. 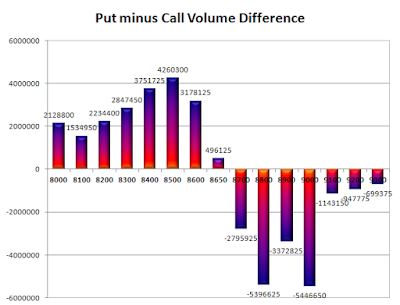 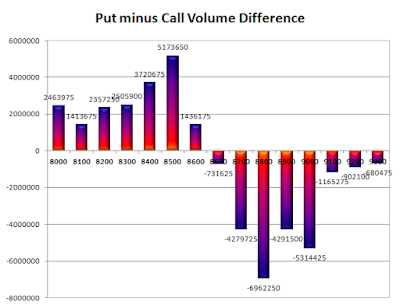 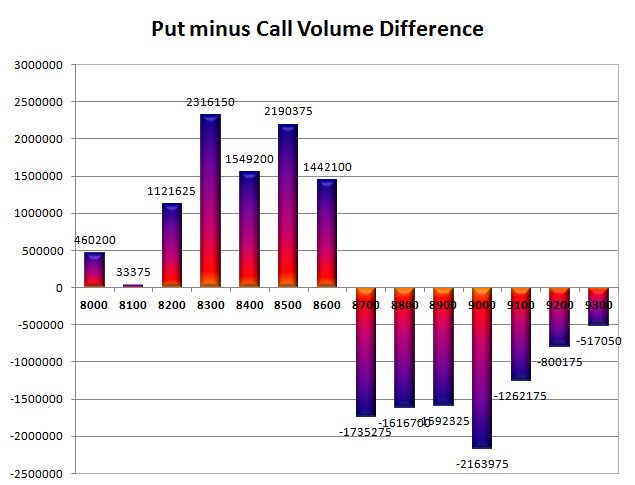 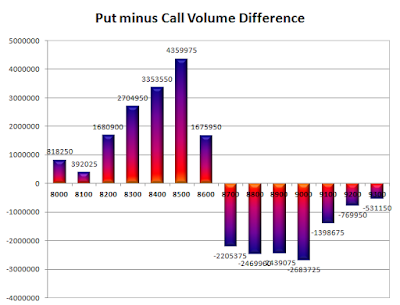 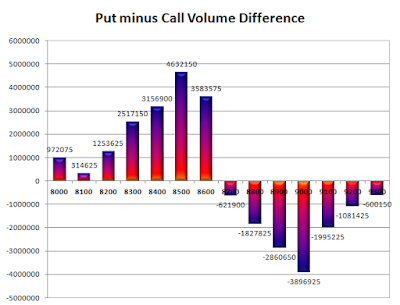 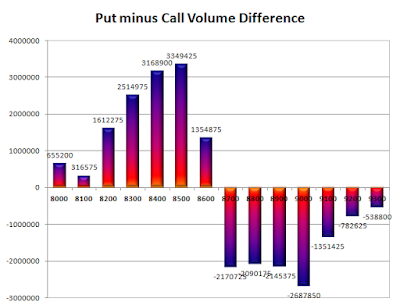 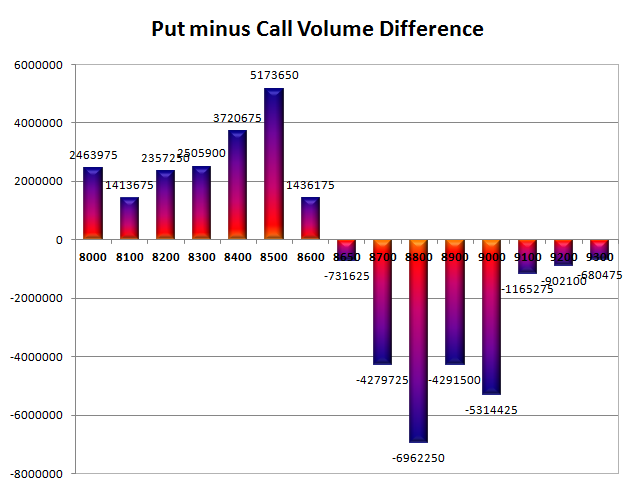 Day Range as per Option Table is 8725 - 8846 and as per VIX is 8726 - 8846 with 8786 as the Pivot. 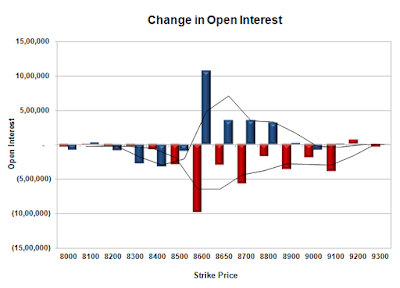 The index opened strong and stayed strong for the entire session of trade making higher highs with each passing hour to close near the highs at 8744.35, huge gain of 136.90 points. 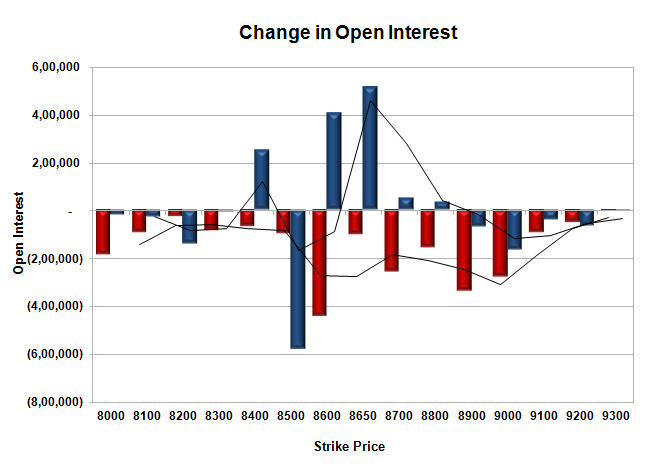 The broader market was strong with 1009 advances to 578 declines. Range stays at 8500-9000. 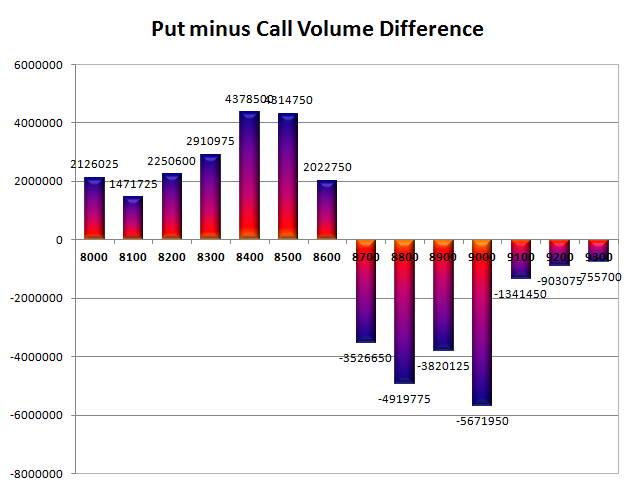 Call option 8800-9300 added 28.32 lacs OI with short covering at 8700 and below strike prices. Put option 8900-8500 added 36.20 lacs OI with profit booking at 8400 and below strike prices. 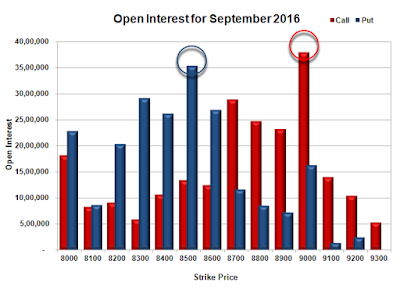 Nifty Open Interest is at 3,04,51,425 up by 26,88,750, with increase in price, probably huge long build-up. Bank Nifty Open Interest is at 26,13,840 up by 4,00,480, with increase in price, probably huge long build-up. 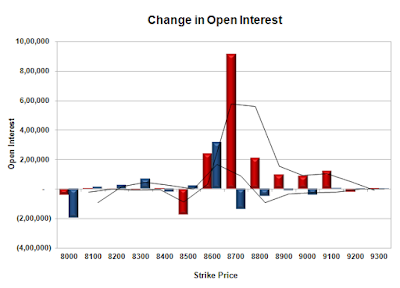 FII’s bought huge 31700 contracts of Index Futures, which includes net 35291 contracts long build-up and 3591 contracts short build-up, with increase in net OI by 38882 contracts, includes 63362 longs to 31662 shorts for the day. 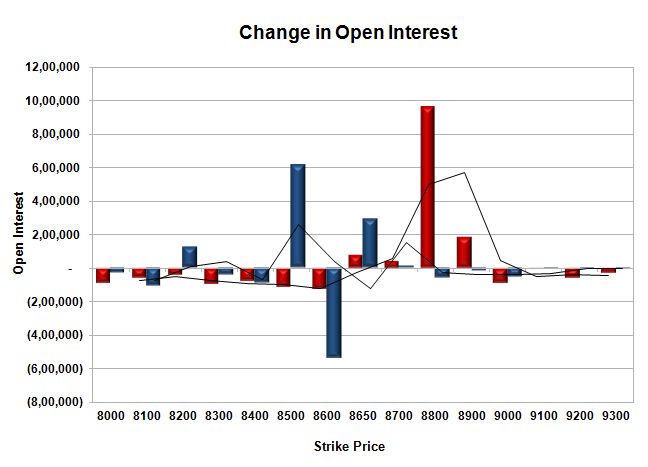 FII’s Index future open contract as on date is 353278 Longs to 43134 Shorts, Net long 310144 contracts. 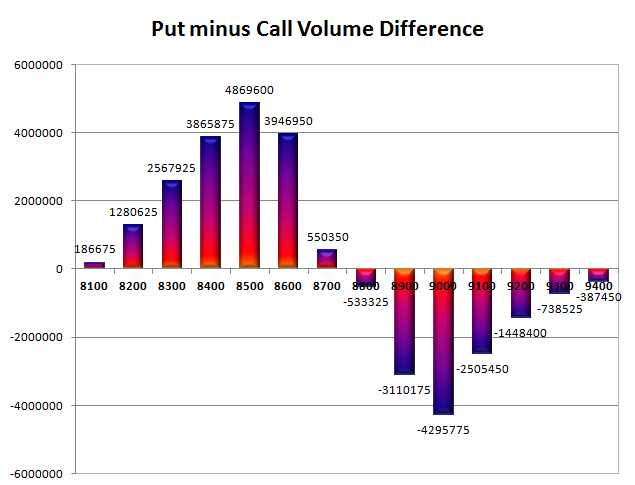 Initial support at 8700, with huge OI addition of 11.51 lacs and below that at 8600 with OI of 56.41 lacs. 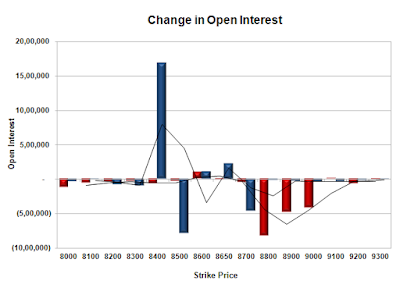 Initial resistance at 8800, with OI of 37.65 lacs and above that at 9000 with OI of 52.33 lacs. 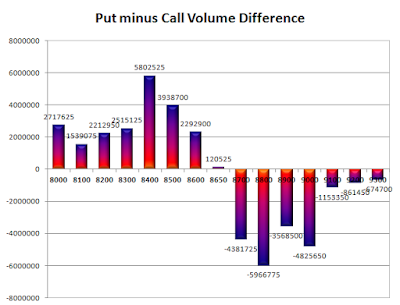 Day Range as per Option Table is 8660 - 8782 and as per VIX is 8685 - 8804 with 8712 as the Pivot. 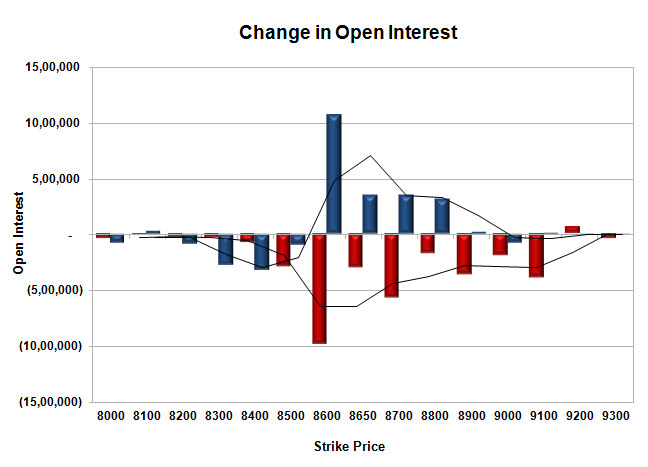 The index opened positive and stayed strong for the entire session of trade to close strong at 8673.25, gain of 49.20 points. 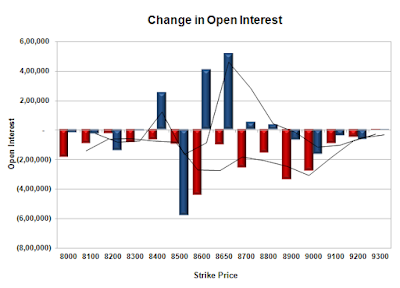 The broader market was strong with 1077 advances to 521 declines. Range stays at 8500-8800. 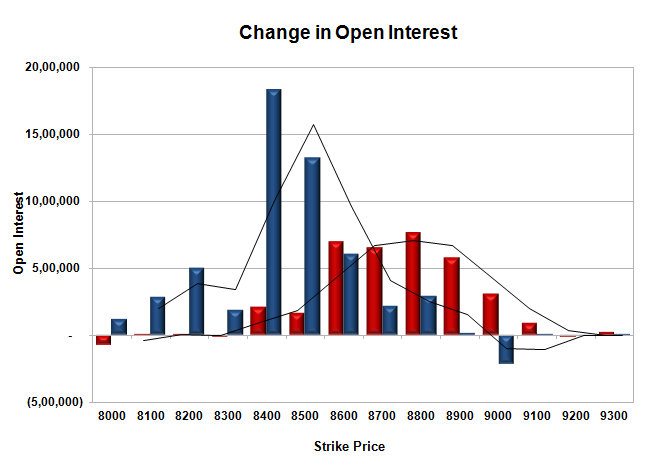 Call option 9200 added 0.64 lacs OI with short covering at 8700 and below strike prices. 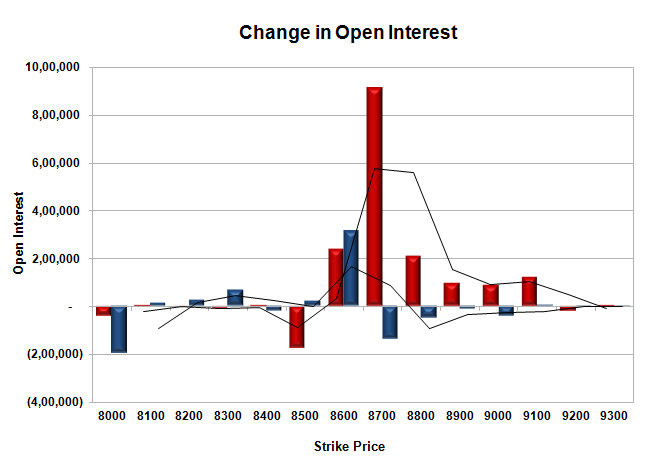 Put option 8800-8600 added 21.00 lacs OI with profit booking at 8500 and below strike prices. 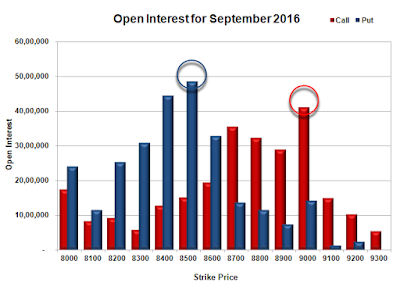 Nifty Open Interest is at 2,38,46,100 down by 7,34,925, whereas next series added 10.70 lacs with increase in price, most probably 100% roll-over with long build-up. 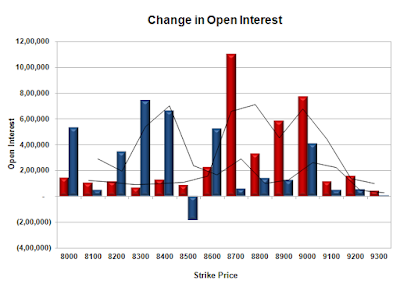 Bank Nifty Open Interest is at 22,17,400 up by 1,73,040, whereas next series added 1.35 lacs with increase in price, most probably long build-up in both series. 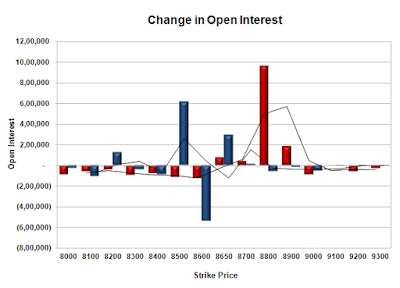 FII’s bought 859 contracts of Index Futures, which includes net 6813 contracts long build-up and 5954 contracts short build-up, with increase in net OI by 12767 contracts, includes 39206 longs to 38347 shorts for the day. 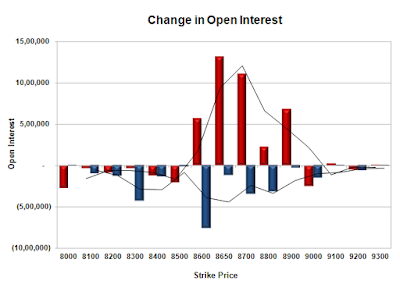 FII’s Index future open contract as on date is 305074 Longs to 54531 Shorts, Net long 250543 contracts. Initial and best support now at 8600, with OI of 55.30 lacs and below that at 8500 with OI of 53.34 lacs. 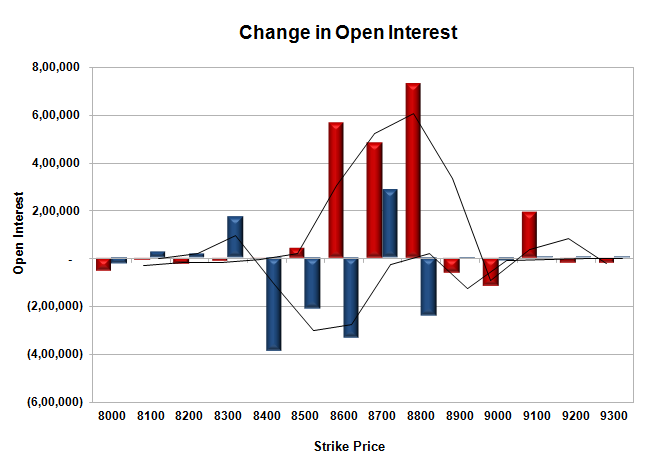 Initial resistance at 8700, with OI of 53.97 lacs and above that at 8800 with OI of 64.33 lacs. Day Range as per Option Table is 8571 - 8688 and as per VIX is 8607 - 8739 with 8670 as the Pivot. 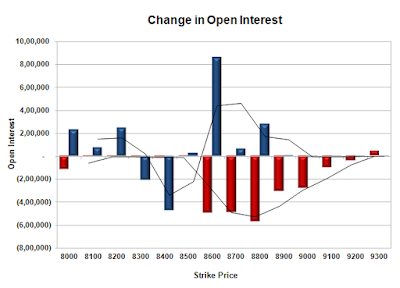 The index opened flat and stayed in a narrow range for the better part of the day but saw huge profit booking to close the day in red at 8624.05, loss of 18.50 points. The broader market though was positive with 883 advances to 703 declines. Range has narrowed down to 8500-8800. Call option 8600-8800 added 17.79 lacs OI with profit booking at 8900 and above strike prices. 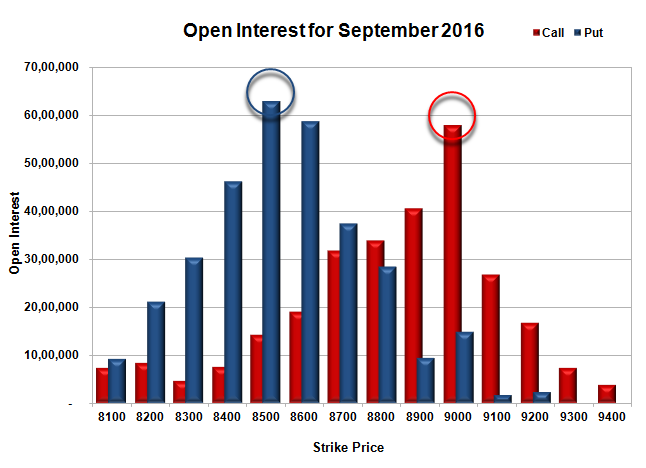 Put option 8700, 8300 added 4.59 lacs OI with short covering at 8800 and above strike prices. 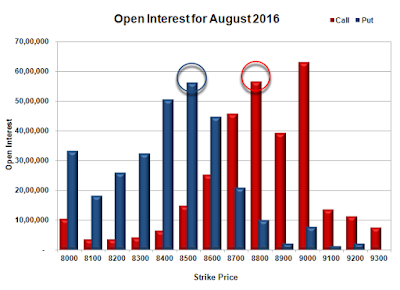 Nifty Open Interest is at 2,45,81,025 down by 2,56,575, with decrease in price, most probably long liquidation. Bank Nifty Open Interest is at 20,44,360 up by 1,41,920, with increase in price, most probably long build-up. 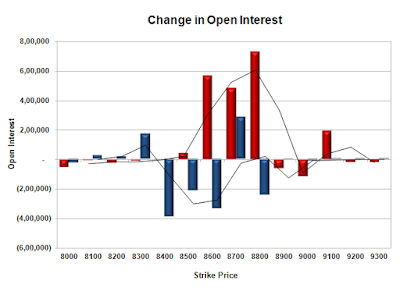 FII’s sold 2141 contracts of Index Futures, which includes net 1640 contracts long build-up and 3781 contracts short build-up, with increase in net OI by 5421 contracts, includes 26354 longs to 28495 shorts for the day. 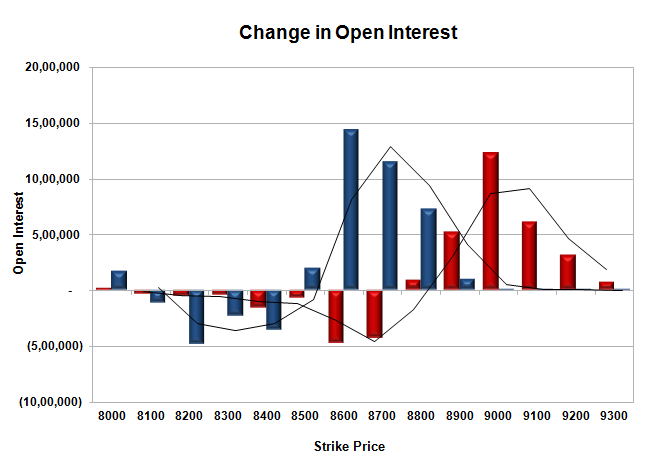 FII’s Index future open contract as on date is 298261 Longs to 48577 Shorts, Net long 249684 contracts. 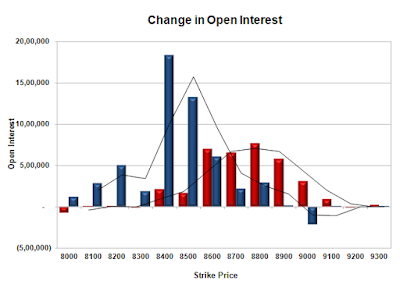 Initial support still at 8600, with OI of 44.57 lacs and below that at 8500 with OI of 54.25 lacs. 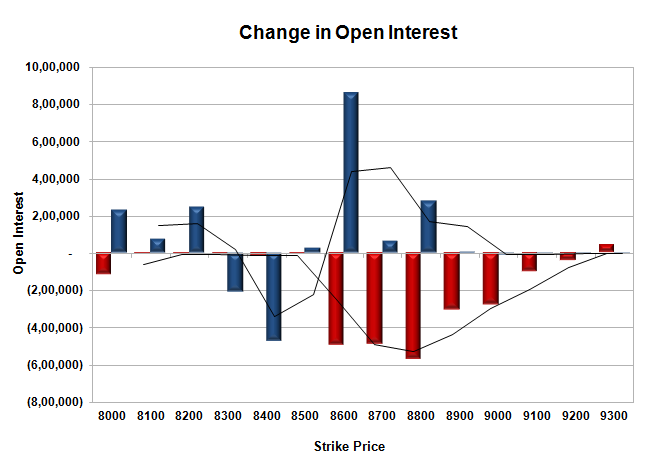 Initial resistance at 8700, with OI of 59.69 lacs and above that at 8800 with OI of 66.09 lacs. Day Range as per Option Table is 8568 - 8690 and as per VIX is 8557 - 8691 with 8632 as the Pivot.